Communicating with people by phone, Skype, or SMS message is often more effective than sending bulk marketing emails. Email Graber will find and collect contact information for you within a couple of minutes, and you can spend the time you save on yourself. Email Graber extracts email addresses, contact information, and Skype, MSN, AOL, Yahoo, and ICQ IDs from the web. 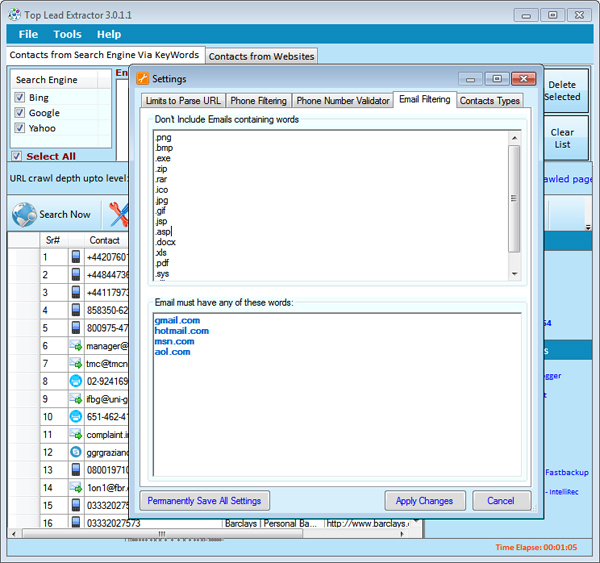 Email Graber supports targeted searches like advance search of google, yahoo, bing etc. It has an option to extract selected or all kinds of information like email addresses, phone numbers, messengers ids (skype, icq, MSN, yahoo). Email Graber has long list of customize-able options so that you can customize your search and search results according to your target and needs. Email Graber searches for email addresses. Due to the multithreading power of the software, the process runs quickly, and at the end of it, you are provided with a list of emails of potential clients. 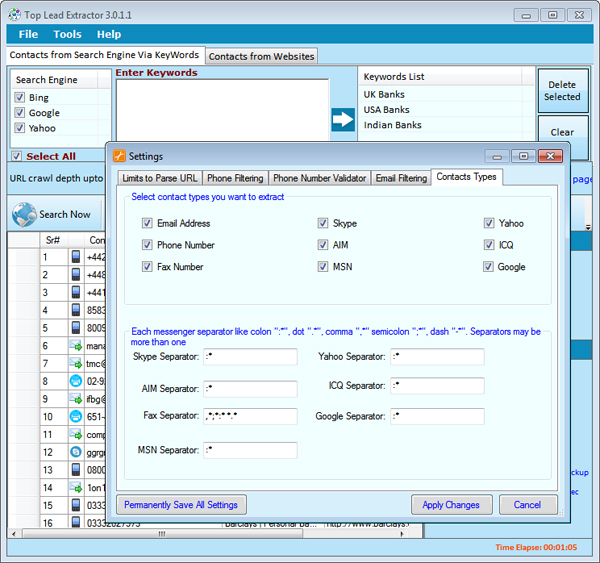 Search phone numbers on specified sites, or search by keyword, selecting suitable sites in search engines. The software is capable of finding not only email addresses and phone numbers, but also data like Skype, ICQ, AIM, MSN Messenger, and Yahoo Messenger IDs. You don't need any additional plugin for this. To save bandwidth and your precious time "Email Graber" has an option "Don't allow recrawling of already crawled pages in new searches". Email Graber automatically pauses/resumes on internet failure during processing. Email Graber support unicode contacts. You can also save fetched contacts in unicode format. 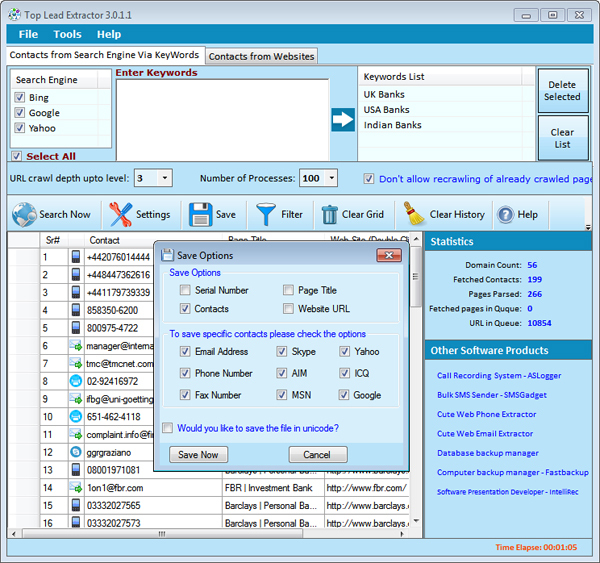 Email Graber support more than 66 search engines. You can search according to your country. It is best tool for businesses to get necessary business contact information from sources ranging from business directories to search engines. Used primarily by marketing consultants for businesses quickly looking for leads for their companies. 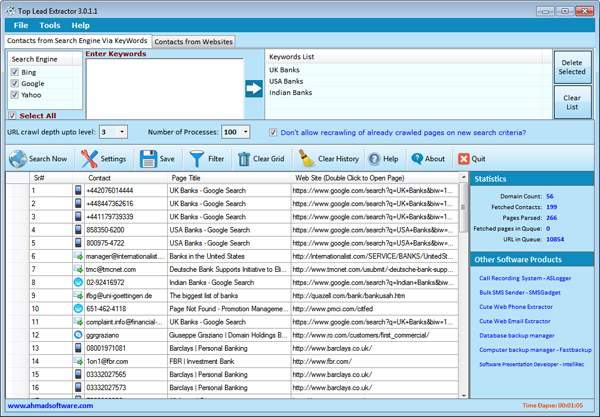 This piece of software has a multi-threading system, in which the contact information is being searched can be found at an exhilarated speed, without compromising computer performance. Internet: Internet connection is required. Hardware: This software can run on any hardware that can run windows. There is no specific requirement to run this software. Software do not support data extraction from images, AJAX, and sites requiring authentication. Email Graber can extract different information types: email address, phone and fax numbers, Skype, MSN Messenger, Yahoo Messenger, ICQ, and AIM. Email Graber will extract data by the entered keyword related to your niche. The program will use the search engine(s) specified. Then it will scan all of the websites and look for information. If you know a website where your potential clients communicate, click on "Contacts From Websites" enter the URL in the "Websites List". Our program will collect the contact information for further calls, SMS messages, or emails. This is one of the best ways to create a targeted contact list. In the settings, you can tell the "Email Graber" which types of URL should not be crawled. Parse only if Page URL have keywords in your defined keyword list. To maximize the correct phone numbers search results, you can define phone number filteration by country code, area code, operator code and phone number minimum and maximum digits length. Email Graber provides options to save contacts in EXCEL format, .CSV files (Opens in EXCEL), TAB delimited (.txt files) format. Save searched results separately i.e. phone numbers, emails and messenger IDs in different files. Settings Tab "Limit to Parse URL"
How to Apply URL Filteration? Don't parse and crawl URL having: "Email Graber" will not crawl URL if URL contains keywords listed in list. You can remove any keyword from default list. 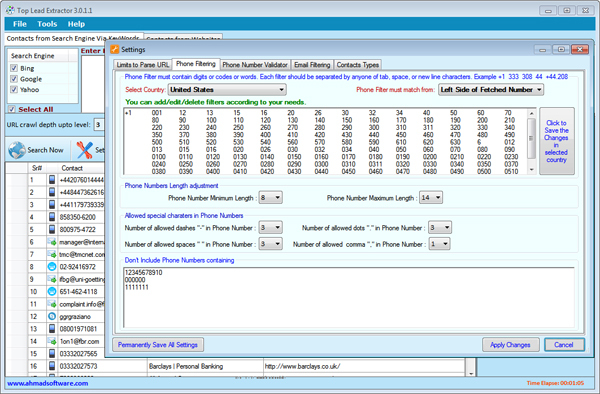 How to Apply Phone Number Filteration? Please select the country for which you want to search phone numbers. If area code of any country or mobile operator code is missing in your selected country then you can add in the codes box labelled with green color. How to Apply Contact Types Filteration? "Select contact type you want to extract:"Check the boxes you want to select contact type extraction. To filter and remove bad Contact information (if any) click on Filter button on toolbar and a popup will open like this screenshot. Comments: Thanks Team of Ahmad Software. 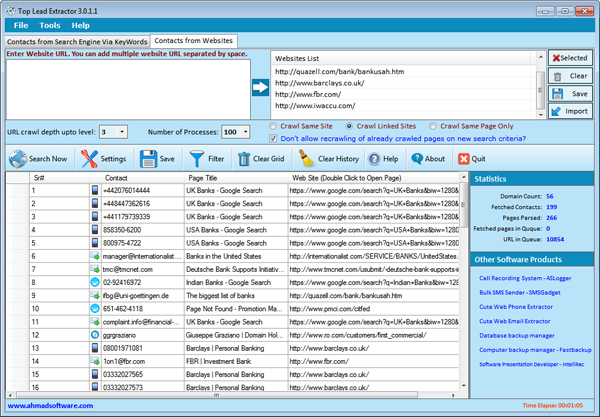 It is the best software for extracting valid emails, phone numbers and social ids from popular search engines and targeted websites. You solve my problem. Thanks a lot!